The threat of malicious software (malware) programs on users’ privacy is now worse than ever. Some malwares can even collude to increase their permissions through sharing, making it easier to breach users’ privacy. However, detecting malware on a mobile phone consumes a considerable amount of a mobile phone’s energy. While the advancements of cloud technology make it possible to transmit malware data to the cloud for analysis, transmitting large amounts of data contributes to the energy consumption problem of mobile phones. 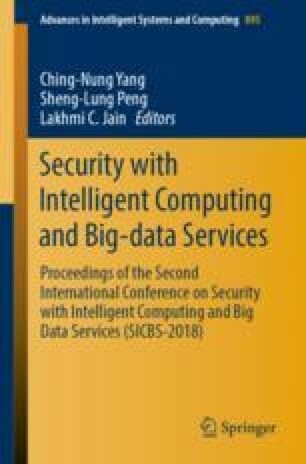 Therefore, this study proposes a fog-based computing technique that targets intelligent collusion attacks and intelligently controls the collection and transmission behavior to reduce the amount of data that is transmitted to lower the energy consumption of mobile phones. This study conducts experiments using an official application and compares it with other methods. The experimental results show that the proposed method transmits less data than other methods and saves the energy consumption of mobile phones. This work was supported by the Ministry of Science and Technology (MOST), Taiwan, under MOST Grants: 107-2221-E-194-022 – & 105-2221-E-194-014-MY2.